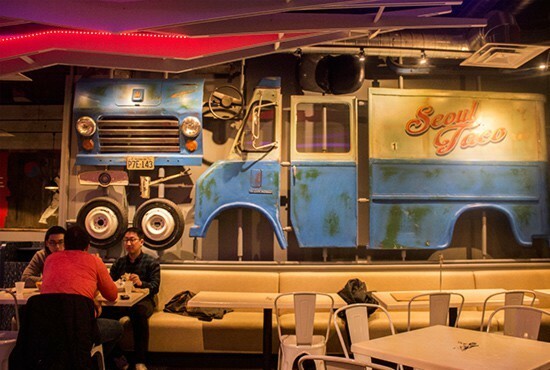 Seoul Taco's truck has a place of honor in its new brick-and-mortar restaurant. Ever since the Seoul Taco food truck took to the streets in 2011, its Korean-Mexican fusion cuisine has been on a roll — outgrowing its tiny original University City location and expanding to larger Delmar Loop digs in a space shared with a conjoined concept, Seoul Q. Since spring, mid-Missourians can even find Seoul Taco in a downtown Columbia storefront shared with fellow St. Louisans, Strange Donuts. While business is booming at each of the various entities that make up David Choi's wildly popular empire, at its core, the brand still gets its drive from mobile roots. Panels representing the food truck that started it all hang proudly in both brick-and-mortar restaurants. Meanwhile, the actual curbside concession still makes its rounds throughout the week, peddling its sublime sustenance to hungry lunchtime crowds. Even with its exponential growth over the years, Seoul Taco continues to do what it always has: cook up honest-to-goodness street food spiked with Seoul sauce and kimichi. To that, we raise a soju glass and leave the Seoul Taco crew with just a few words of eternal encouragement: Keep on truckin'. 314-863-1148, www.seoultaco.com.